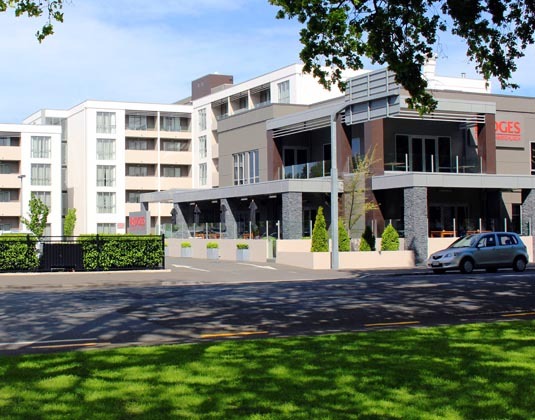 Overlooking scenic Latimer Square in the heart of the city, Rydges Latimer offers stylishly appointed rooms within easy reach of many local attractions, including Canterbury Museum, International Antarctic Centre and the Cardboard Cathedral. The hotel restaurant, Bloody Mary's, features fresh seasonal ingredients in every dish while dark oak and rich leather furnishings give it a warm, comfortable feel. In superior rooms with air-conditioning, shower, mini bar and safe. FREE upgrade to next room category: If you stay at least 3 nights. Also receive two drinks vouchers for the hotel bar. NZ$75 food & beverage credit: Please ask for details.